By Dan Ambrose: Junior middleweight contender James Kirkland (30-1, 27 KO’s) is matched against a tough opponent in Carlos Molina (19-4-2, 6 KO’s) next month on January 28th at the Reliant Arena in Houston, Texas. Kirkland, 27, is riding high right now after stopping well respected junior middleweight contender Alfredo Angulo in the 7th round last month on November 5th in something of an upset. Big things were expected from Angulo and it looked as if he was going to blow through Kirkland after he knocked him flat early in the 1st round. However, Angulo exhausted himself trying to finish Kirkland off and ended up getting knocked down late in the round. Angulo never got his second wind and his lack of hand speed severely hampered what he was able to do in the remainder of the fight. Kirkland merely did what he always does by throwing a ton of punches to get the win. The thing is Kirkland really didn’t get hit in the other than in the 1st round, and he didn’t look good when he receiving punishment. That’s the knock on Kirkland. He can dish it out but he doesn’t take a good punch at all if you unload on him with combinations then you have a good chance of dropping him or taking him out. Molina, 28, is faster than Angulo and won’t run out of gas in the 1st round like he did. Molina is going to hit Kirkland a lot in this fight and Kirkland is going to have to show some punch resistance if he wants to get this win, because he’s going to get hit more than he has in a long time. The only fights Kirkland took some shots in were his 1st round knockout loss to Nobuhiro Ishida last April and in his fight against Brian Vera. If Molina can stand in there and test Kirkland’s chin over a number of rounds, we could see Kirkland hitting the deck again. He just can’t take a solid punch for some reason. Molina isn’t a big puncher but he hits hard enough to make his opponents miserable and he has a way of just taking over fights with his high work rate and powerful body attacks. Molina was pretty much ripped off in his two fights with Julio Cesar Chavez Jr. and his fight with Erislandy Lara. I saw Molina winning all three of those fights with his excellent inside work. His record should be a lot better than it is. 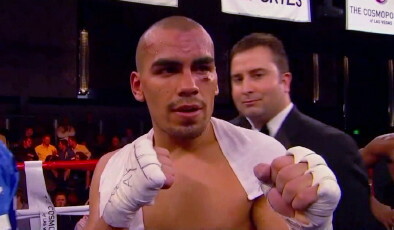 I also thought he beat Mike Alvarado, but lost an eight round decision in that fight.